Are you remodeling your master bath and wondering where to start? Here are 8 tips from Bathroom Ideas You Can Use that will inspire you and help you best utilize your space. CONSISTENT COLOR SCHEMES ARE MORE CRUCIAL IN LARGE BATHROOMS. Keep your bathroom color scheme under control to maintain a calming, serene feel to the room. Color schemes are especially important in larger bathrooms, where the color interactions play out more dramatically. The neutral scheme used in this master bath certainly creates a soothing feel, but the room hardly lacks for visual excitement. A wide range of neutral tones—from beige to almost black—and a dynamic mix of tile sizes, shapes and configurations combine with stunning decorative elements to make a bathroom design that invites the visitor to linger. RELY ON WINDOWS TO LIGHT LARGE BATHROOMS. This lightsoaked bathroom enjoys a wealth of open floor space; a wicker chaise longue creates an area for pure relaxation—a common designation for large, luxurious bathrooms. Add furniture to your spacious bathroom to add function. Notice that this room doesn’t scrimp on style elsewhere either; pebbled tile covers the bath deck and shower surround, matching the yellow monochromatic color scheme. OPULENCE MAKES SMALL SEEM BIG. Just because your master bathroom is not especially large is no reason for it to lack luxury. As this room shows, even a small bathroom can appear and function as a sumptuous space. The rich look is created by using a wealth of dark-wood details, a tiled wall surface, and specific accents that bring a huge dose of style, including a small chandelier and a large mirror propped up next to the bath. The mirror not only provides a lovely decorative element, it also serves to visually expand the room. USE ACCENT LIGHTING FOR UNIQUE SAFETY AND COMFORT. Turn to the uncommon for an even more special master bath design. Recessed halogen lights make the tile sparkle, but more importantly, they provide added safety for anyone getting out of the tub after enjoying a relaxing candlelit bath. Spotlights in the base of the tub platform are also unusual elements. Accent lighting in the bathroom inevitably serves two purposes—decoration and safety. What’s more, the marble tiles that cover the surfaces in this luxury bath are a predictable choice. The use of three long shelves in place of a traditional vanity is not. USE ANGLES TO MAXIMIZE SPACE. Play the angles to get the most out of a narrow master bathroom. The shower and tub in this room are a perfect example of how to fit luxury in a skinny space. Angled back against one another, the features make for an interesting mix of lines, but they supply full-scale bathing in an abbreviated space. Getting the most out of any bathroom is, to one degree or another, always about positioning major features in the room in a space efficient way. USE A WATER CLOSET TO MAXIMIZE EFFICIENCY IN BUSY BATHROOMS. These small, self-contained rooms-within-a-room essentially ensure that more than one person can use the bathroom at a time, and they hide away the least attractive fixture in any bathroom. Water closets themselves can be made luxurious with the addition of a wired-in sound system, magazine racks, special heaters, or even a phone or intercom connection. USE CROWN MOLDING OR OTHER ACCENTS TO TIE ROOMS TOGETHER. Be design-wise and integrate elements in your master bathroom that tie the room to the bedroom or any other spaces connected directly to the bathroom. One of the most effective ways to do this is to use the same crown molding throughout the rooms as was done here, with the distinctive wood molding that matches the custom-made vanity. You can also unify adjoining rooms with wall color, window treatments or even similarly shaped or colored accents. The more design elements contiguous rooms share, the more pleasing the aesthetic is to behold. DIVIDE LARGE ROOMS INTO FUNCTIONAL AREAS. Where your bathroom is large enough, consider dividing it into separate functional areas. A divider wall in this room separates the bathing area from the sink and vanity. A large cabinet unit positioned in an alcove provides enough storage for clothes, making the sink area also a dressing area—another function that can be added to a large bathroom. 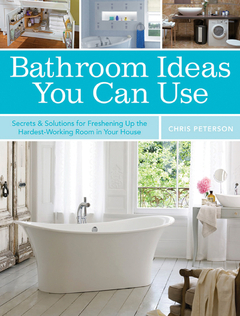 A 176-page design and inspiration book that is packed full with gorgeous photos of beautiful bathrooms and highly desired bathroom fixtures. This is a hardworking, editorially-driven source book, guide book and manual for people who are beginning the bathroom remodeling process. Bathroom Ideas You Can Use contains page after page of useful information and intelligent discussion, but still features hundreds of beautiful photos of rooms, materials and fixtures. All of the most common fixtures are included: multi-head shower stalls, tubs and spas, vanities, lavatory sinks, toilets and bidets, vent fans and even saunas and infrared steam baths. Accessories can transform a plain bath into a luxury salon, including: towel warmers, anti-fog mirrors, cabinetry and cabinet organizers, paper holders and towel rods, shower doors, and home electronics. Whatever your plans may be, from a simple refreshing to a complete makeover, your next bathroom remodeling project starts here.